The first comprehensive guide to oneirogens--naturally occurring substances that induce and enhance dreaming. Includes extensive monographs on dream-enhancing substances derived from plant, animal, and human resources. Presents the results of scientific experiments on the effects of using oneirogens. Shows how studies in this area of ethnobotany can yield a scientific understanding of the mysterious mechanism of dreams. 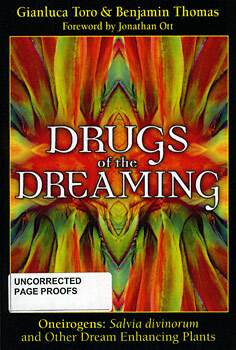 Drugs of the Dreaming details the properties and actions of these dream allies, establishing ethnobatnical profiles for 35 oneirogens, including those extracted from organic sources--such as Calea zacatechichi (dream herb or "leaf of the gods"), Salvia divinorum, and a variety of plants from North and Sourth American and the Pacific sued in shamanic practices--as well as synthetically dreived oneirogens. They explain the historical use of each oneiroge, its method of action, and what light it sheds on the scientific mechanism of dreaming. They conclude that oneirogens enhance the comprehensibility and facility of the dream/dreamer relationship and hold a powerful key for discerning the psychological needs and destinies of dreamers in the modern world. Gianluca Toro, an environmental chemist, is the author in Italian of Animali Psicoattivi (Psychoactive Animals) and numerous articles about naturally occurring and synthetic dream-enhancing agents. He lives in Italy. Benjamin Thomas is an independent researcher specializing in the effects of drugs and plant extracts on hjmans, particularly in Papua New guinea. He has published many articles covering a wide range of subjects and lives in Australia.